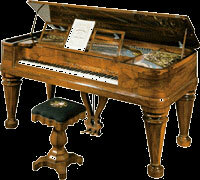 Uprights usually cost less, depending on the model, however some can exceed grand pianos in total value. Although uprights often are depicted as inferior to the grand pianos, a five-foot upright can rival a typical grand in terms of tone quality and loudness. Essentially the keyboard is the same and like the grand, varies in material construction. Console 40"-43" ~58" Comes in variety of styles and finishes. It is made with a direct action, thus producing more enhanced tones. Studio 45"-48" ~58" Seen mostly in music schools and music studios; it is very durable. Larger soundboard and larger strings produces good tone quality. Full Size/Professional 48"-60" ~58" Tallest among vertical pianos. When cared for properly, it stands the test of time and mantains its rich tone. Older type of piano your great grandparents would have played. Grand pianos are the largest piano type, and frequently the most majestic (as well as expensive). Grand Pianos (also known as horizontal pianos) are categorized by horizontal soundboards sometimes stretching up to 4 ft. (front to back). The Soundboard is encased in a supportable opening platform that lifts on the left in an upwards direction. Dampers lie on top of the strings, adjacent to the hammers (also horizontal). The internal construction is braced with form-holders, usually made of wood, as well as the small equipped metal reinforcements. Essentially the casing is "bottomless" allowing one to see the soundboard support base, also of reinforced wood, which technically acts as the base. Keys consist of wood coated in ivory, or sometimes pure ivory, depending on the piano's manufacturers and classification. The grand piano has the standard 88 keys. Most of these pianos have sheet music platforms. A retractable cover slides over or folds down on the keys. Grand pianos are said to produce finer tones and has the most responsive key action. Petite Grand 4'5"-4'11" Smallest of horizontal pianos, but still powerful. Baby Grand 4'11"-5'6" Very popular type because of its sound quality, esthetic appeal and affortability. Concert Grand 7'6"-9'+ Largest of all grand pianos. Good for beginners or moving performers, electric pianos are usually the most affordable, and although they do not have the qualities of an acoustic, sound continues to improve for the high-end and mid-range instruments. They vary greatly in quality; some have hollow keys, while others try to replicate the feel and weight of acoustic keyboards. In addition to the features of an acoustic piano, electric pianos have a variety of sounds and settings such as organ, guitar, string, choir, and percussion. The numerous sounds on some keyboards make it virtually a portable band. Other pianos have limited functions, but this is better for someone who is trying to replicate an acoustic and save money. True electric pianos (compared to the plain keyboards) have a professional appearance and good materials (most consist largely of plastic), as well as touch sensitive features and sometimes equipped frames. Most have connectors for pedals and computer interactive abilities. They never need to be tuned, and are rapidly becoming more popular in modern bands. The electric piano also has the advantage of allowing the user to practice silently with headphones at times when doing so would otherwise disturb people. The few drawbacks are technological infancy and power supply.